Cast on 4 sts with Mc. * Knit 4 sts. Do not turn work but instead push stitches to the right end of the needle. Pull yarn to tighten sts into a tight neat loop. Rep from * for 25 cm. Thread the pipe cleaner onto the tapestry needle with a 1 cm tail on the other side. Bend the tail down on itself to secure the pipecleaner to the needle. Carefully thread the tapestry needle through one end of the i-chord through the centre and up through the other end. Unbend the i–cord tail and remove the tapestry needle. Slowly pull the pipecleaner back down through the i-cord until the top of the tail end is just covered by the i-cord. Cut the excess pipe cleaner off at the other end, flush with the i-cord. 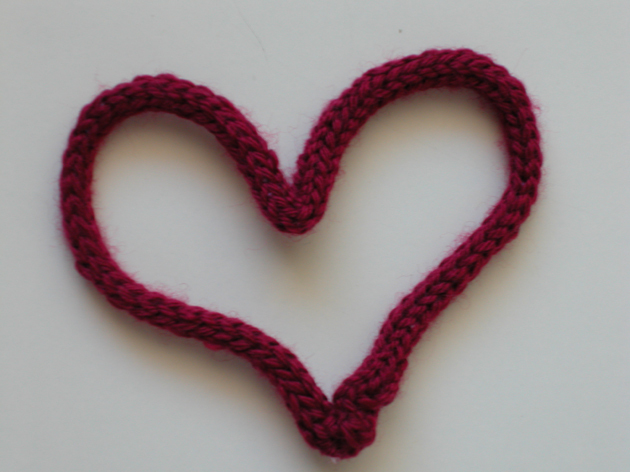 Now bend the heart into shape, by firstly folding i-cord in the centre then shaping the two curved arches of the heart and bringing the two i-cord ends together into a point and neatly sewing them together with the tail ends of yarn. Fasten both tail ends of the i-cord. Now the When My Heart Finds Christmas decoration is finished. All you need to do is attach some contrasting ribbon to the top of the Heart and hang in your Christmas tree. Left over pieces of Biggan Design DK yarn in two contrasting colours. * Knit 4 sts. Do not turn work but instead push stitches to the right end of the needle. Pull yarn to tighten sts into a tight neat loop. Rep from * for three rows. Change to Cc1 * Knit 4 sts. Do not turn work but instead push stitches to the right end of the needle. Pull yarn to tighten sts into a tight neat loop. Rep from * for three rows. NB: when working Cc1 ensure that Mc stays in the centre of the i-cord by hanging it over the needle to the left of the stitches being worked. Change to Mc * Knit 4 sts. Do not turn work but instead push stitches to the right end of the needle. Pull yarn to tighten sts into a tight neat loop. Rep from * for three rows. NB: when working Mc ensure that Cc1 stays in the centre of the i-cord by hanging it over the needle to the left of the stitches being worked. Repeat the above until you have 5 lots of each colour. Now bend the candy cane into shape. Now the Calorie Free Candy Cane is finished you can decide whether to make it into a brooch, a Christmas tree decoration, or make a pair and attach them to fish hook earrings for festive jewellery. Make up one leaf at a time; thread the pipe cleaner onto the tapestry needle with a 1 cm tail on the other side. Bend the tail down on itself to secure the pipecleaner to the needle. Now bend the Holly leaves into shape, by firstly folding i-cord in the centre then shaping the two curved points of the leaves and bringing the two i-cord ends together into a point and neatly sewing them together with the tail ends of yarn. When both leaves are finished, use left-over yarn to sew the two leaves together, and attach beads. Now the ‘Tis the Season to be Holly decoration is finished. All you need to do is attach some contrasting ribbon to the top of the Holly and hang in your Christmas tree; alternatively you can attach a backing pin behind the beads to make a brooch. Cast on 3 sts. K 2 rows. Row 3: inc 1 in first and second sts, K1. K another row. Row 3 & 4 = 5 sts. Row 5: K1, inc 1 in second and third sts, K2. K another row. Row 5 & 6 = 7 sts. Row 7: K1, inc 1, K2, inc 1, K2. K another row. Row 7 & 8 = 9 sts. Row 11:*cast off first 4 sts, K until end of row. Rep from* on next row, leaving 3 sts on needle. K another row. Row 14: inc 1 in first and second sts, K1. K another row. Row 14 & 15 = 5 sts. Row 16: K1, inc 1 in second and third sts, K2. K another row. Row 16 & 17 = 7 sts. Row 22: K1, inc 1, K6, inc 1, K2. K another row. Row 22 & 23 = 13 sts. Row 24: *cast off first 4 sts, K until end of row. Rep from* on next row, leaving 5 sts on needle. K another row. Row 27: K1, inc 1 in second and third sts, K2. K another row. Row 27 & 28 = 7 sts. Row 33: K1, inc 1, K6, inc 1, K2. K another row. Row 33 & 34 = 13 sts. Row 35: K1, inc 1, K8, inc 1, K2. K another row. Row 35 & 36 = 15 sts. Row 37: K1, inc 1, K10, inc 1, K2. K another row. Row 37 & 38 = 17 sts. Row 39: K1, inc 1, K12, inc 1, K2. K another row. Row 39 & 40 = 19 sts. Fasten off loose ends. Measure up 18cm/7″ length of red yarn, fold in half and tie the two ends into a knot. 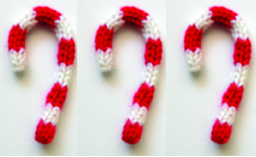 With a 3mm crochet hock draw the top loop of string through the top of Christmas tree, as shown in picture, thread the knotted part through the loop on other side and pull tight. Christmas tree is ready to hang onto the real tree! This entry was posted in Free Patterns and tagged Christmas, decorations, free, knitting, patterns on February 15, 2013 by eleanormargareta.